A Literary Odyssey: The Classics Club. In March 2012, Jillian launched The Classics Club. 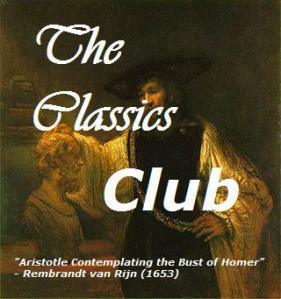 Basically, the club is a place for classics readers and bloggers to find each other and discuss reading the classics. Since I am still a little over 100 books away from completing my first list, those titles will be rolled into this challenge. Those books will be my first priority to read and finish. The rest of my challenge list will include other classics I want to get to in the next five years. Before I show you the list, I want to explain why there are so many titles. Since working on my 250 list, I have become incredibly inspired by the classics, and I want to continue exploring authors I love as well as new ones. I think that at least for the near future, I will remain on a classics heavy "diet." Because of this, I went crazy making this list. This is a far off goal to finish all of these, so I'm not putting a date on it. But I will read all the books on this list. First up is the list with the remaining 114 books on my 250 list. The second list contains the books I will transition to after. That list contains more than 300 titles. I will be balancing both lists, and while the first list (my original project list) will remain a priority, I will be including titles from both lists in my reading selections. Yes, I know that I'm insane. But I love my classics, and I am going to keep exploring. (I reserve the right to change titles on the second list at any time). Thanks! You too! The classics are fabulous! Allie, isn't this fun? I LOVE seeing more Alcott and Austen on your list! I'm really really happy you joined. Yay for re-reading Whitman and The Odyssey. I tried to keep it to a small number, but since I really want to explore the entire back-libraries of different authors, I caved in. There are simply too many books I want to read, and since I want to read all of these eventually, I figured I would just write them down so I have a list to refer to (let's say, if I give up blogging in the future). And yes, I do remember meeting you. :) I'm glad we're both still pursuing what makes us happy. You have SO many good books to read still. I'm really excited about the club and how many people are participating--I'm looking forward to reading what everyone thinks of the books they've chosen. Allie you are totally crazy. Ha! I love this. Amazing list - I'll know where to come if I want to find more titles for mine. This is going to be great fun! Oh thank you! I figured I would go with it and list everything I possibly could so I have tons of options. I imagine that I'll continue adding to it as we go! Yeah, I figured I might as well try it one more time. I still don't know if I'll love it, but I have a greater appreciation for Dickens now that I've read more of his work! Great list! I am currently working on my and post for it. I am still working on my list - I can't decide which books, how many or for how long! I kind of consider myself a semi-pro at reading classics, since I have been focusing on them for almost 3 years. Changing over to a classics diet has had a HUGE impact on my life! Wow, what a list! I have a feeling if I had let myself go, I'd have a list just as lengthy, and with no hope of getting through it any time soon. I have to admit, I'm a little surprised that you still have so many books left on your first list--it feels like you're moving through it so quickly! Enjoy! Lol. I know what you mean! And the sad thing is, there are still SO MANY MORE to add! Wow, so many great books on your list! I could do an entire blog posting of comments. I'm happy to see some of my favorite authors, including Zola, Trollope, Wharton, Cather, and Maugham. And Steinbeck!! I need to work on my own list for the club, but I think I'll leave it at fifty to start. Yeah, 50 is a much more reasonable number than 450. ;) And I can't wait to read more Zola. I know you've read a bunch by him, so I can't wait to explore more beyond Germinal. I won't be able to read all of these in five years, but this gives me a lot of books to look forward to in the future! I see Les Mis on your list!!! I'm so excited, I've been thinking of hosting a read along mid Sept (to finish just before the release of the new movie). Let me know if you're interested. I'm going to need some support, that's one massive book! I'm "participating" in a readalong of it now, but I haven't even started. :) I want to finish it before the movie comes out, so I'm game! I'm so excited that there is a list like this out there! I'm a junior in high school and I really love classic, but in my class' curriculum we never read more than like 7 books. Thank you so much!